Residents in Barna have set up an action group due to their concerns over the proposed new Galway city bypass. The group will hold a public meeting in Barna Golf Club next Wednesday evening at 8pm. Earlier this year, six options for the new road were unveiled to the public. There was uproar when it was revealed that between 50 and 130 houses would be demolished to make way for the road, depending on the route chosen. 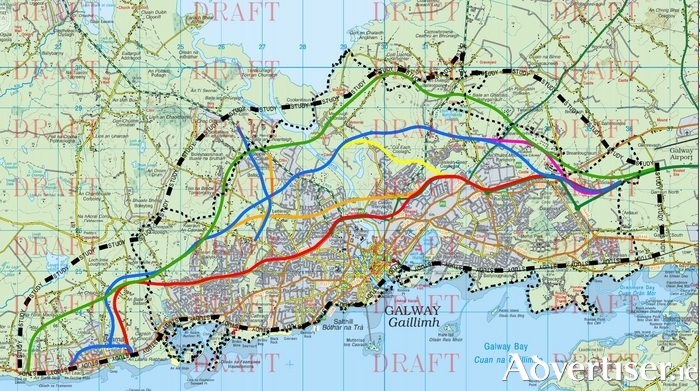 Galway County Council is the lead authority on the project and county council planners are working in tandem with their city counterparts, The National Roads Authority and ARUP Consulting Engineers. The preferred route for the N6 Transport Project is due to be announced by the end of this month. Landowners and homeowners on the selected corridor will be contacted before the route is made known to the public. There has been much anger and frustration expressed due to the fact that the 39 elected county councillors and 18 city councillors have no statutory role in the decision making process. There has also been major consternation about the impact of the plans on two of Galway’s best known landmarks; NUIG and Ballybrit racecourse. Residents of a number of areas that will potentially be adversely affected, including Menlo, Newcastle, and Busypark, have also organised public meetings to voice their opposition to the controversial proposals. Frank Flynn is another who is of the view that planners must try and get the original Galway City Outer Bypass route progressed via Article 6.4 of the European Habitats Directive. The IROPI [Imperative Reasons of Overriding Public Interest] provision - as Article 6.4 is known- was first used to seek approval for a motorway in Hessen, Germany. Galway Harbour Company has also used it to make a case for its harbour expansion plan. Article 6.4 states that a project which compromises the integrity of a priority habitat may still proceed in the absence of alternative solutions. A plan or project may be carried out for imperative reasons of overriding public interest, including those of a social or economic nature. Council planners and representatives from ARUP Consulting have argued that a planning application under this clause will be unsuccessful as there are proven alternative routes, to the old outer bypass, in place.